Well, with fabulous sun protection, your kids can sing this song all summer long. Flap Happy hats are just what the doctored ordered. 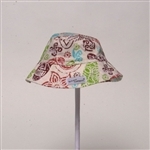 UPF 50+ hats go perfect with the other clothes in the Los Angeles based line. Some are fitted with straps to keep the hats secured around those cute little faces, while others are reversable with stylish prints. So, get the sand tools ready and put your floaties on, it’s Summer time! ← Tinkering on the edge of greatness!